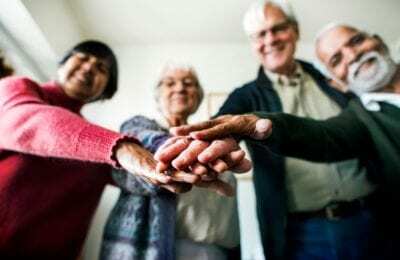 If you have an aging parent, grandparent, or other relative, you may be wondering what their options are for living as they age. In this article, we’ll discuss all of the different living arrangements for older adults, and the pros and cons of each. Let’s begin. Aging at home is often the best choice for older adults. It allows them to preserve their autonomy and individual freedom. Potential costs of this method include the expense of at-home care, as well as adding safety equipment such as non-slip carpet, bathroom and shower bars, stairlifts, and other such equipment that can ensure a safe living environment. Moving in with a family member can be a good idea for an aging adult, especially if they have a good relationship. Like aging in place, costs of this method include updating a home to ensure safety equipment is in place for an older relative. Senior living communities are apartments, homes, or condominiums designed specifically for seniors, with features like safe walk-in showers, elevators, and regular checks by senior living community staff. Senior living communities may be more expensive than alternative housing arrangements, but are still quite affordable. Assisted living is different than a nursing home. Assisted living facilities are for older adults without significant medical needs, so they have fewer nursing staff, but are less expensive. Nursing homes offer skilled medical care 24/7, and are ideal for older adults with serious physical or cognitive disabilities. They are comfortable and safe for seniors, but also very expensive, given the nature of care delivered. Find The Option That’s Right For You And Your Loved Ones! In most cases, it’s best to consult a loved one about their preferences when making the decision about where they should age. 90% of seniors would prefer to age in place, or live with family members – rather than move to a retirement community, assisted living facility, or nursing home. So think about the pros and cons for each method, and you’re sure to find the one that’s right for your family.